Growing up in a family of medical practitioners, Dr Ho knew it was only a matter of time before he found a similar calling. Motivated by his parents, who were medical professionals, upon seeing their long-standing relationships with patients, it became clear that this was the perfect career choice for himself. In addition to being a “people person”, Dr Ho enjoys being able to “build” beautiful smiles for patients—he’s extremely hands on when it comes to crafting crowns, implants and veneers. 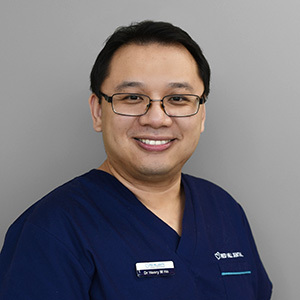 Dr Ho attended the renowned University of Otago where he received his Bachelor of Dental Surgery in 2003 and then went on to receive his Master of Implant Dentistry from Griffith University in 2014, and postgraduate qualifications in Orthodontic Dentistry in 2013. With a lifelong passion of learning, he continues to take professional development courses to afford his patients the absolute best care. He’s recently completed courses on subjects including advanced endodontic training, pinhole dentistry, periodontics and Invisalign. Dr Ho is a member of the Australian Dental Association, American Academy of Cosmetic Dentistry, Australian Prosthodontic Society, and International College of Continuing Dental Education Fellowship. Dr Ho is only one of a few dental surgeons qualified in Queensland to perform the revolutionary Chao Pinhole Surgical Gum Rejuvenation Technique. When he isn’t helping patients achieve the smile of their dreams at work, he enjoys spending time cooking, reading, and building models. Get to know more about Dr Ho when you book your next visit with us!